We guarantee full confidentiality to our customers! 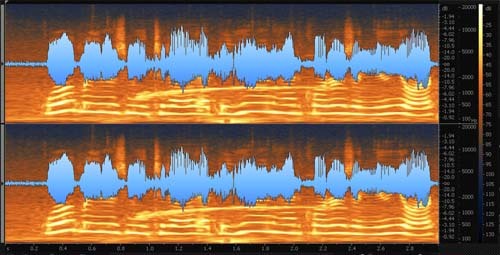 Audio file cleaning: noise, hum, hiss removal. We perform: audio cleaning and enhancement, noise removal and audio restoration, hiss and hum removal, distorted audio recovery and other tasks which improve sound quality. 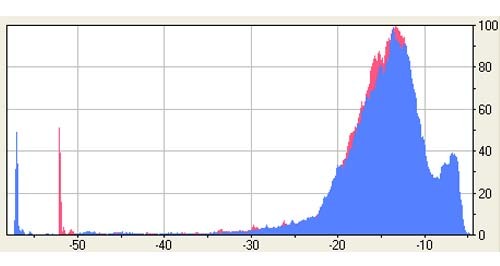 Thanks to above analysis we identify audio characteristics with noise specification both in time and frequency domains. We can start audio cleaning process to improve its quality. If you want to test quality of our service please send to us test recording for processing minimum 90 seconds long. We will perform free of charge: indepth audio analysis and process it removing noise, hum, hiss thus improving its quality. You will evaluate final result before placing your order. Analog to digital format convertion. Sounds around us (ie. human voice, music, sounds of nature etc.) are analog in their nature (continuous). We have to convert them into digital format to be able to apply digital methods of audio processing to remove noise, hum, hiss or to restore its original quality. There are two parameters important in analog to digital convertion: sampling frequency and sample resolution (ie. number of bits used to encode each sample). These two parameters have profound influence on quality of audio file being converted into digital format. We can digitize human voice with acceptable quality using 8kHz sampling frequency and encode samples with 8bits per sample. Better audio quality requires higher values for these two parameters. For CD quality we need 44.1kHz sampling frequency and 16bits per sample. The more bits we use to encode each sample the more precise we are in digitizing process ie. 8bits equals to 256 encoding levels, 16bits gives us 65536 encoding levels and 24bits provides us with more than 24 millions encoding levels. The drawback is increased file size and required computing power to process such audio files. Digital sound file formats and setup of voice recorders.